Uncle Fester has done it again! The underground mastermind of psychedelic cookery has provided up-and-coming Owsley-wannabes with Practical LSD Manufacture, the most detailed, comprehensive and concise description ever of several of the methods employed in the preparation of lysergic acid diethylamide, or LSD, from natural sources. Uncle Fester also offers a breakthrough in psychedelic literature: a simple process for extracting the hallucinogenic drug TMA-2 from the commonly-grown calamus plant. A never-before-published presentation of "Method X," wherein a propionic anydride mixes with lyergic acid, allowing for a much-improved synthesis. 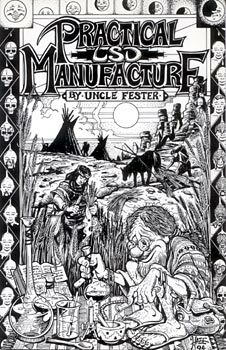 Loompanics Unlimited is proud to offer Uncle Fester's complete, illustrated guide for anyone who is interested in Practical LSD Manufacture! Sold for information purposes only!